I first heard about the SCA in high school. It was summer and I had spent the last week playing videogames. Well my parents thought that was being a bit too lazy, so we all went out to a demo at Trethewy House. I got to see heavy combat, and see all of the cool costumes and the medieval stuff and thought “dude, I could do this. It would be like being in one of the novels I read”. So I started looking into it and quickly realized three things. First I’d need money (which I didn’t have), second I’d need time (which I didn’t have), and third I’d need transportation (which I didn’t have). So I figured I start when I had them. I kept looking into the SCA, and kept up on it, but it wasn’t until my first year of college that I had time, money (not much, but a bit), and a drivers license. So I sent an e-mail to a random guy named Kieran Gunn who was seneschal of the local group at the time. He gave me a call and said that there were two practices coming up. An armoured practice on Sunday, and a rapier practice on Tuesday. Well, at the time I was swing dancing every Sunday. So I decided on the Rapier. I gave him my address and he said he’d come pick me up. Tuesday rolled around and my doorbell rang. There was a really big guy standing there with long hair and a beard. I looked up… way up. “Hi, I’m Kieran.” We got to practice, I meet a bunch of cool people. Learned about fencing. And was hooked. Someone told me that there was an event coming up and said that she’d make me a quick tunic for it. So I attended my first event, which was Sealion War 2002. The next month I attended Lionsdale Champions, and then went to Highland-Fjord war in Krakafjord. I attended a few more events that year, but was fully hooked. I kept playing and fighting and was also dancing at the time. At one point I was running the dance practice in Lionsdale, which was immediately prior to fencing. In 2005 I was attending Eisenmarche Shire Banquet. I wasn’t competing that day, I had come to marshal instead, and due to a lack of marshals I also marshaled for the armoured combatants, and got to see the Prince Ulf fight the King of the West from the best viewpoint there was. I couldn’t stay for the banquet, and so was getting into the car to go home with Algernon in the evening when a runner came and shouted for me. I was being called before an impromptu court called by Princess Bernadette. I came back inside to see a court set up sans thrones. 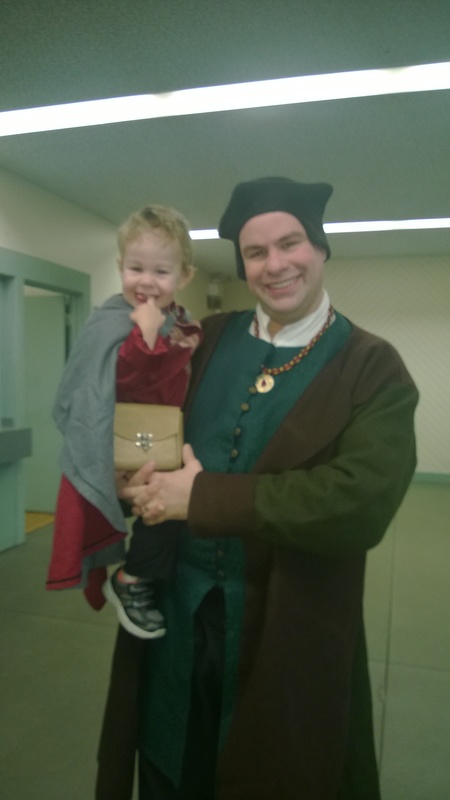 I was directed to kneel before them and the next thing I remember I was being handed a scroll and given a hug, I had been given my Award of Arms. I was completely dumbfounded for most of the ride home. I went on to Autocrat Lionsdale Champions in 2006 and 2007, and was the Deputy Master of Blades for a few years. In 2006 I sent an open letter to the SCA Board of Directors entitled “The Refrigerator Proposal” which was an attempt to get the Board of Directors to change their perception of membership so as to increase the number of members in the SCA. Durring the summer of 2006 I moved to Surrey B.C from Abbotsford and resigned as Deputy Master of Blades. I stepped back from the SCA to concentrate on school, only attending Lionsdale events. 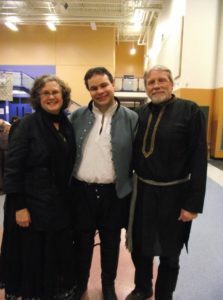 In 2008 I moved to Lytton, and stepped out of the SCA almost completely. 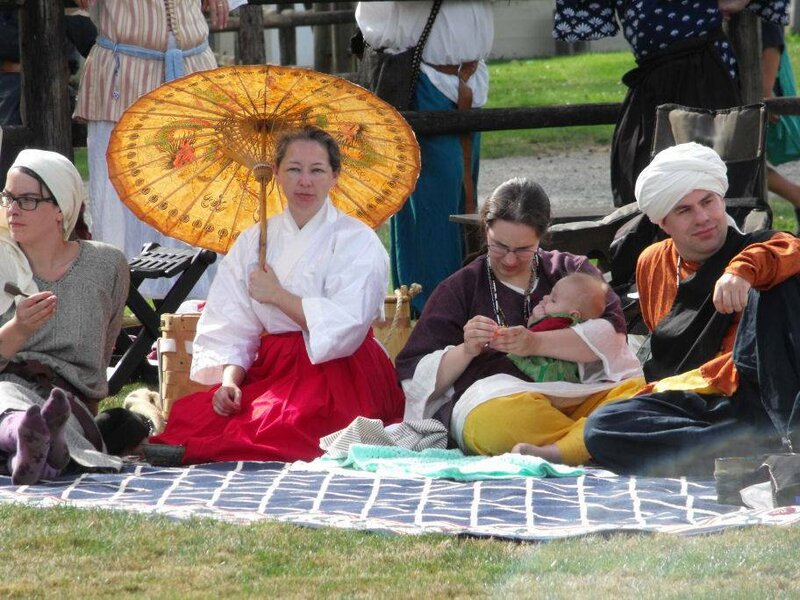 In 2009 I moved back to Abbotsford and My Lady and I began attending events again. During my time out of the SCA I didn’t have much time for fencing, and had mostly stopped fencing even by 2007, except for the occasional practice. I had however started doing research into various things. Primarily costuming and cooking. When we came back to the SCA we determined to enter two A&S competitions that were coming up that year: Sealion War for a war point, and Lionsdale Champions for a fun A&S competition. We salted venison and salmon and cooked them two different ways for Sealion War, and made a Tarte of Prune for Lionsdale Champions. Both entries won. We noticed a lack of research in a number of A&S competitions, and so decided that we would both win a championship the next year, 2010 and spend our time as champions encouraging more people to try research. Also in 2009 I traced all of the boundaries of the Tir Righ branches in Google Earth to create a KML file for those who wanted to know official boundaries for various branches. I also included and adapted Kean de Lacy’s version of the Central branches. A few months later I finished by tracings all of the remaining An Tir branches and converting it to a Google Map so everyone could use it. You can take a look at this by going to the cartography page. In 2010 My Lady Kayleigh won the Lionsdale A&S Championship at Winters Tourney, and I won Lionsgate A&S Defenders. We decided to try to encourage people to do more research, and as part of that, we created an Intro to Research class that we offered in Lionsdale. In the late Fall of 2009 I started fencing again, and went to my first tournaments in February of 2010. 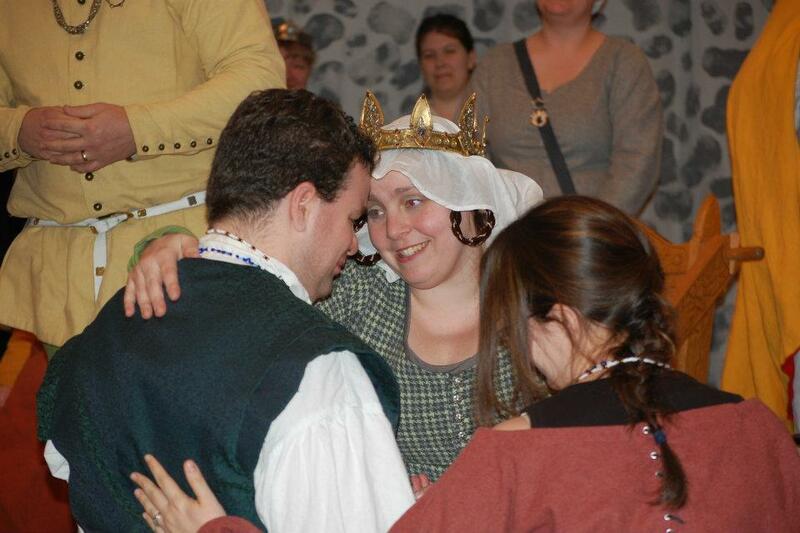 In April 2010 My Lady Kayleigh, Viscountess Thora and myself autocratted the first Tir Righ Heraldic Symposium. In the evening Kayleigh and I were getting ready for the feast during court. Her majesty had come down to the event, so there was both a Principality and Kingdom court that evening. We were working on the feast when someone came and told us that we had to watch the beginning of court. We were watching from the back, as we didn’t have time to sit down when someone came and got me to go and look to see if there was any more toilet paper, as the bathroom that was being used by the royals was almost out. I went to see if I could find any, and couldn’t, and as I came walking back to see court again I heard people calling me to go into court. Confused, I stepped in with Kayleigh at my side, and Thora took our hands and led us half way up, then pushed me forward and knelt with Kayleigh. I walked the rest of the way into court and knelt before Queen Wrenn. I was inducted into the order of the Goutte de Sang. We were called back into court twice more throughout the courts to thank us for running such a good event. 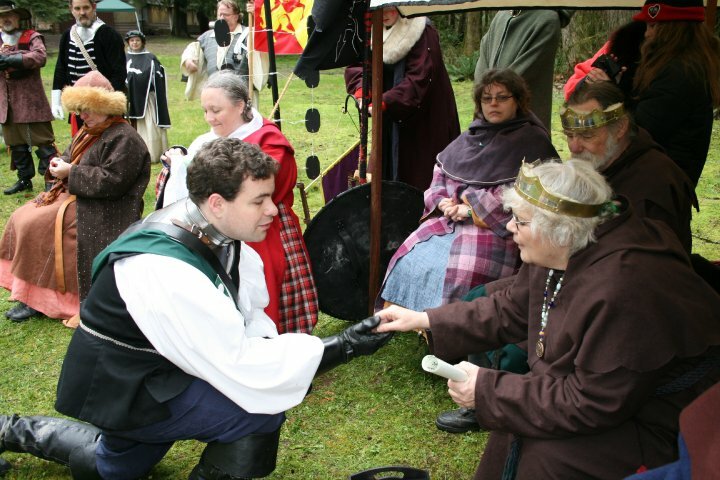 At Sealion War 2010 I was made Baroness Caitrin’s Champion of Combat for chivalry on the warfield. At AT War 2010 I entered some dishes I made that were similar to what a Roman legionary would have eaten, both while in their fort, and while on march. I won the competition for the Tir Righ side. In August 2010 I stepped up as Seneschal of Lionsdale. On August 28, 2010 I became a student to Viscountes Safiye al-Konstantiniyye. I entered “An Examination of Coffins” as a single entry at Tir Righ Arts and Sciences in October 2010 and got some amazing feedback which helped me to understand how to enter at higher levels. At Winters Tourney in February 2011 I was given a Scapula Leonis, the token for great service to the Shire of Lionsdale. I stepped down from my position as A&S Defender of Lions Gate in late February 2011 at their Winter Defenders event and was inducted into the Order of the Lions Claw. 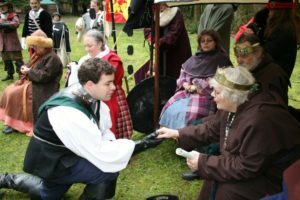 I was the Seneschal of Lionsdale for two years during which I wrote the Lionsdale Customary (listing of traditions and rules for running the Shire). 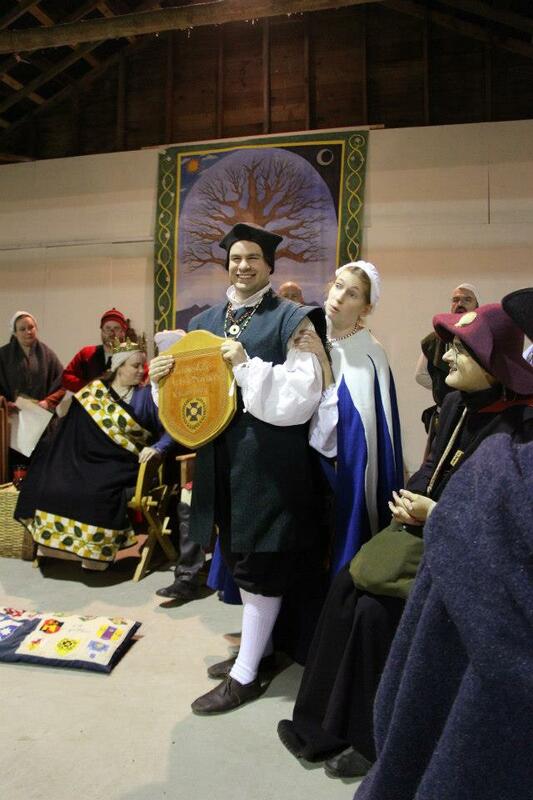 In 2012 I ran Winters Tourney and at court I was awarded the Silver Pillar and Jambe de Lion, while my lady was awarded the l’Etoile d’Argent and Goutte de Sang. In 2013 at Winters Tourney I became the Lionsdale A&S Champion having entered a Meal Onboard Ship. My son was born shortly thereafter, and that summer we brought him to his first event. Work and life outside the SCA got very busy after this and we only occasionally did anything in the SCA in 2014 and early 2015. In Fall of 2015 I got a new job and moved our family to the newly made Kingdom of Avacal in the Barony of Montengarde. Part of this was being released by my Laurel of five years Mistress Safiye al-Konstantiniyye. She is still my mentor but she wants me to find a Laurel in my new Kingdom. I attended a tavern locally and got introduced to the Montengarde Culinary Group (not a guild) and we attend all of their meetings. We attended our first local event at Montengarde 12th Night 2016. I spent most of 2016 and 2017 working on various culinary projects, including a great deal of work on sugar and several articles published in and out of the SCA. I also began working on my two entries for Kingdom A&S. In 2018 I became the Kingdom of Avacal Champion of Arts and Sciences with my entries Stew Onboard Ship in the 16th Century and Pre 17th Century Bacon. That spring I also became a Student of Mistress Inga in hraustliga. 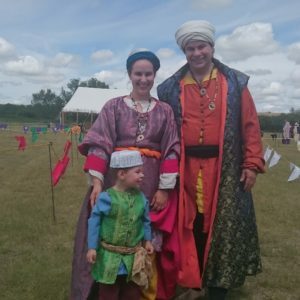 The rest of 2018 I attended many events, and did a lot of cooking, including getting to cook for the King and Queen of Avacal at AT War.